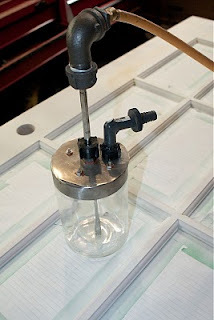 I have started a Cnc laser cutter with the hopes of building something good enough to cut SMD solder stencils. I havn't done much modifications to my powder coating machine in a while since its been working pretty well. 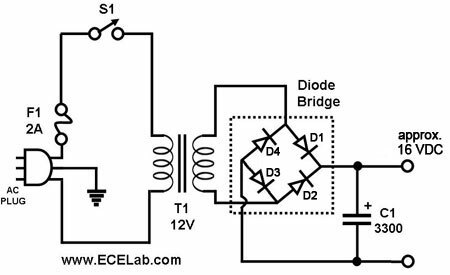 The design is a fairly simple topology; It consists of several voltage rails which come together to generate between 10-25KV. 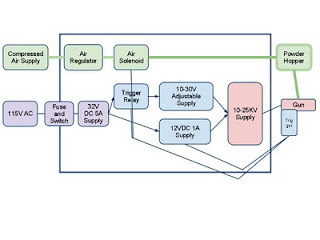 Air and voltage is controlled via a trigger on the gun. If there is interest I can have some boards made for the adjustable HV supply. I have been thinking about making up PCBs for the main part of the supply; including everything after the step down transformer. Let me know if you're interested and I'll do up a board; or maybe some kits. 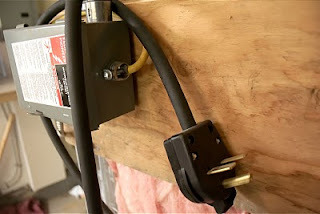 Build around a 24V toroid transformer I had kicking around. Stepped down to ~32VDC using a pair of bridge rectiviers and some filter caps. Filter Caps are ~1000uF 60V if I remember right. I added a bleeder resistor to discharge the caps when powered off. 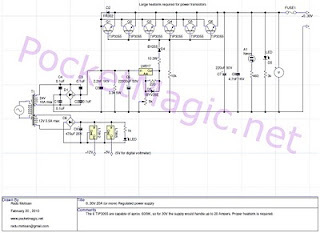 This is the main supply used for driving the the flyback transformer; its based around an array of LM317 adjustable voltage regulators in parallel. 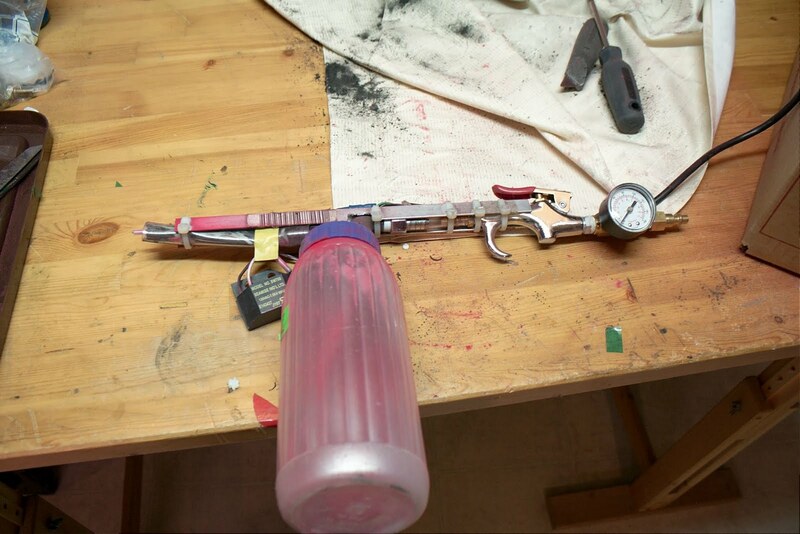 The output is controlled via a relay driven by the trigger on the gun. 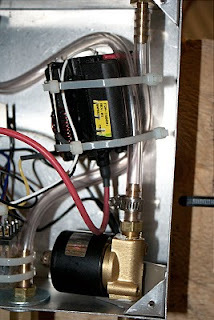 The relay also drives the air supply solenoid. 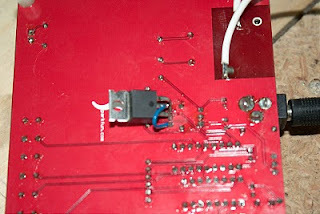 Note that I used only one 2N3055 transistors since I don't need nearly as much current. 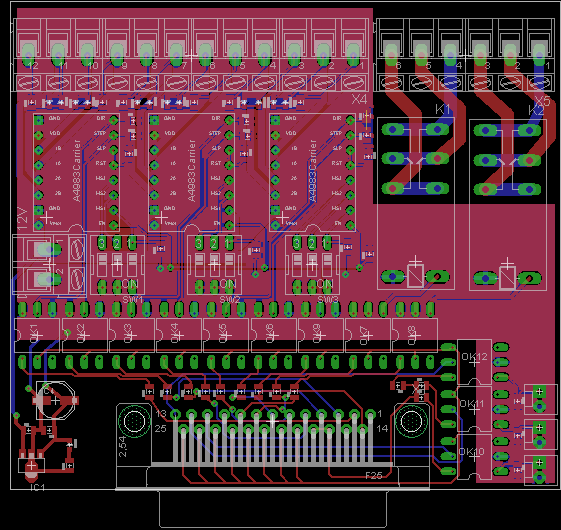 Standard 12V supply based around a LM7812 linear regulator; nothing too exciting. 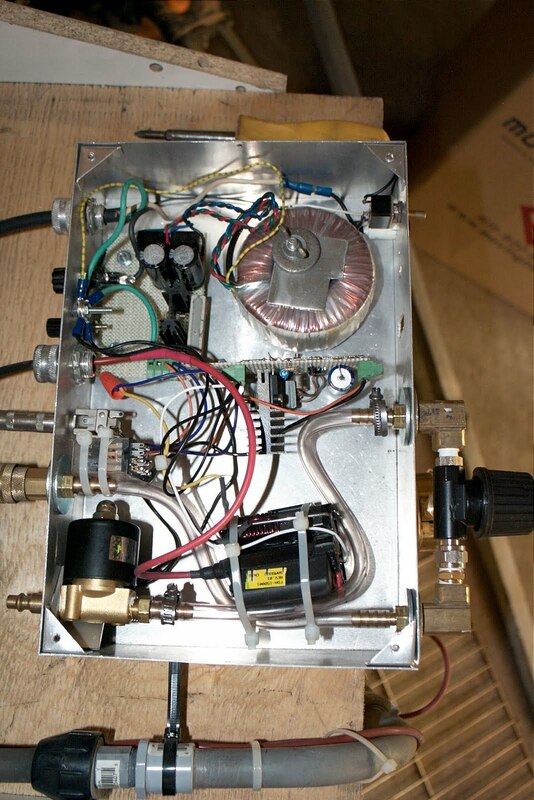 Its used for the 555 pwm generator used for the HV supply as well as for the coils of the relays and solenoids. 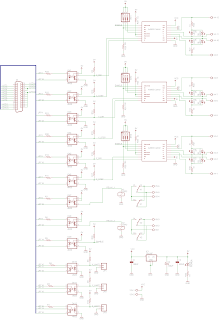 I used a standard flyback driver architecture as seen in the circuit below. 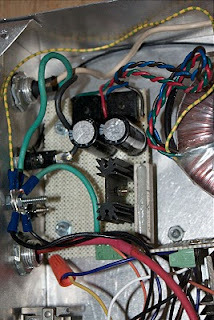 I used a larger driver mosfet and added a diode across the flyback primary and a zener to protect the gate of the drive mosfet. Used the same totem mosfet driver topology. The potentiometer off the 555 was adjusted until I smelled ozone and heard the air ionizing around the HV output of the transformer. 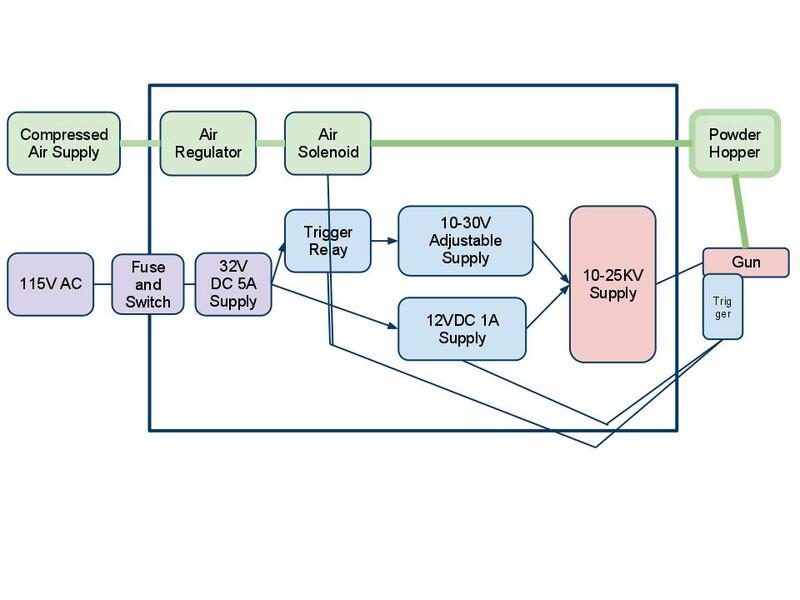 I used the 12V supply referenced above instead of using another regulator as in the diagram. I received some hardware back from a client today with the following failure. Not sure if the polarity was reversed when they hooked it up or if the output was shorted. $23 an hbridge, ouch. I have been doing hardware design and prototyping using surface mount devices for quite some time. 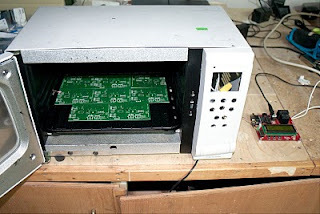 I have tried many method of reflowing boards but I've found both the oven method and "hotplate" method to work quite well. 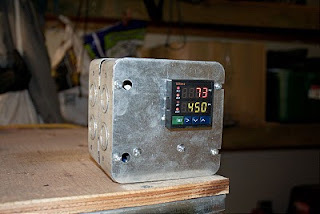 In the past I have been managing the oven and hotplate via a thermocouple and PID controller but I decided to move to a full ramping controller to make the process less labor intensive. 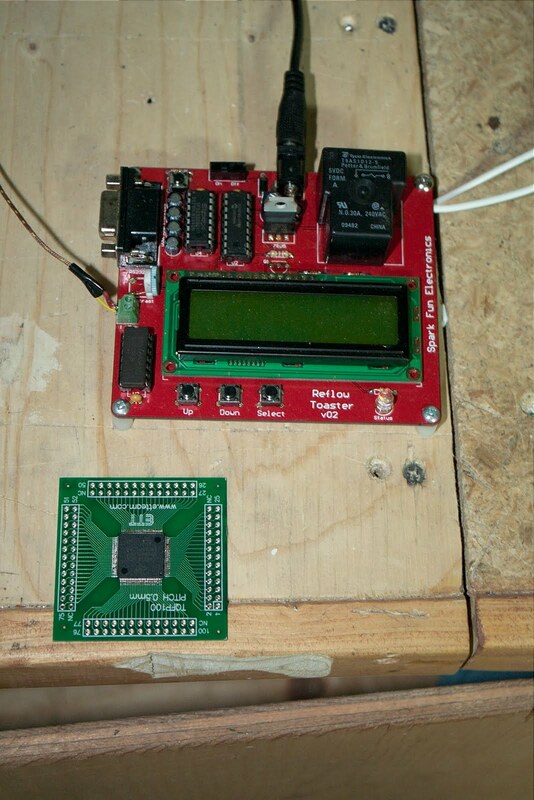 I purchased the reflow oven controller kit from sparkfun, overall it works ok; the software is good but the hardware has some flaws. Most notably is the driver for the relay; they're using a BJT which doesn't seem to want to drive the relay coil reliably (even after modding the base resistor). 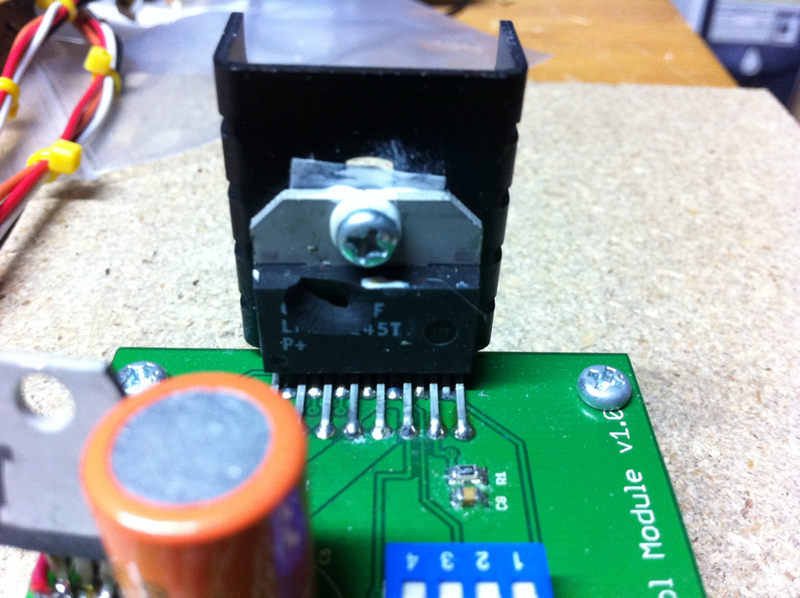 I solder a mosfet in its place (note the uglyness in the pic below) I used a n-channel mosfet I had kicking around in my junk box. Another flaw is their choice in relay; the one that was shipped to me didn't have blade connectors on the top (as pictured on the site) so I had to solder wires on the bottom (not very elegant). 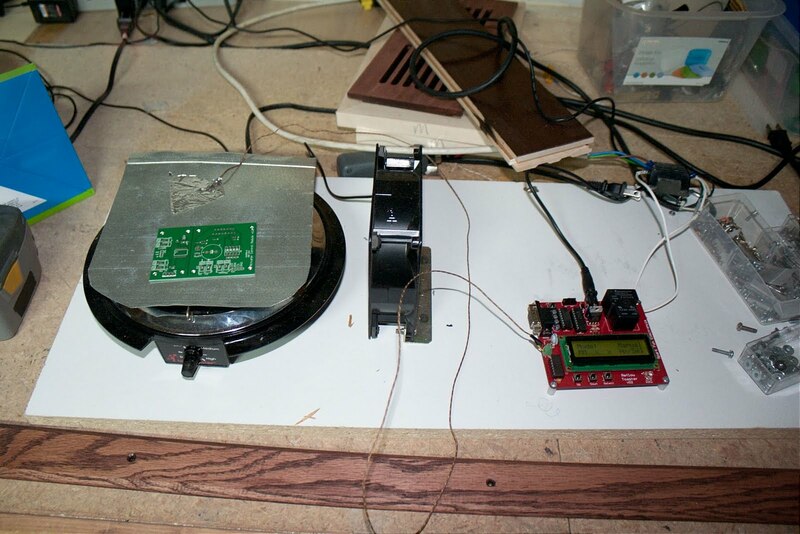 The controller didn't work well for the hotplate; the hot plate has too much thermal mass and the control loop on the temperature controller is too simple to compensate. The controller does work quite well for the oven (for which it was designed). 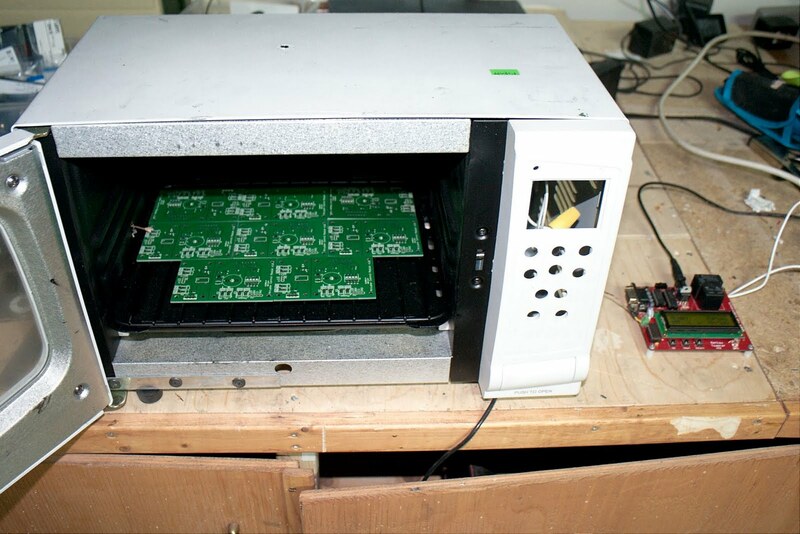 The plan is to mount the controller in the oven chassis and run the LCD and buttons to a new front panel. Results using this system have been good; I have been soldering the processor I'm using for a design (LM3S6965) in a TQFP-100 package; results have been good. 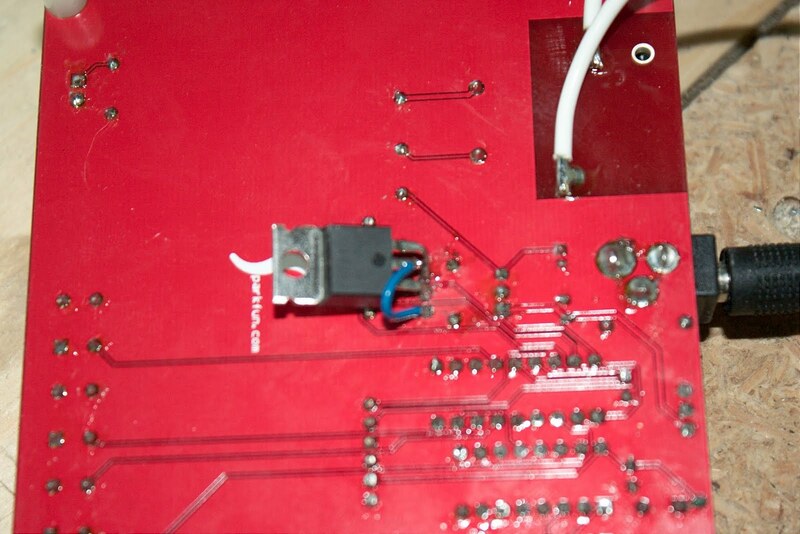 Minimal reword required; just wicking a few solder bridges. 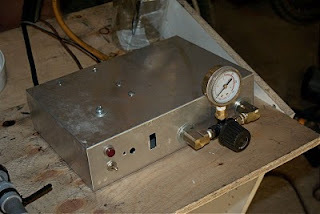 So over the last few months I have built a number of powder coating guns as well as a powder coating oven. 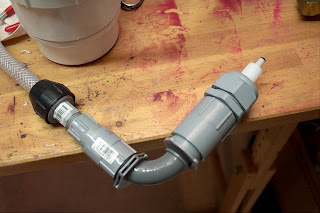 I'm trying to make something better than the $60 harbor freight gun, from what I have read the HF gun tends to not give consistent powder output and struggle with multi coat. 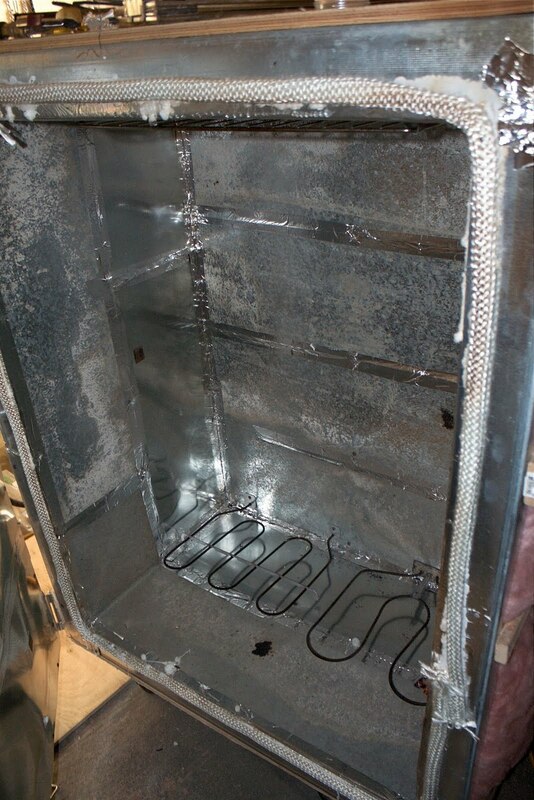 The overall design was pretty much the same; I used an old toaster oven to bake it. It worked ok, but the voltage was too low to get good powder adhesion on additional coats, and it was hard to clean and didn't put out a consistent powder flow. 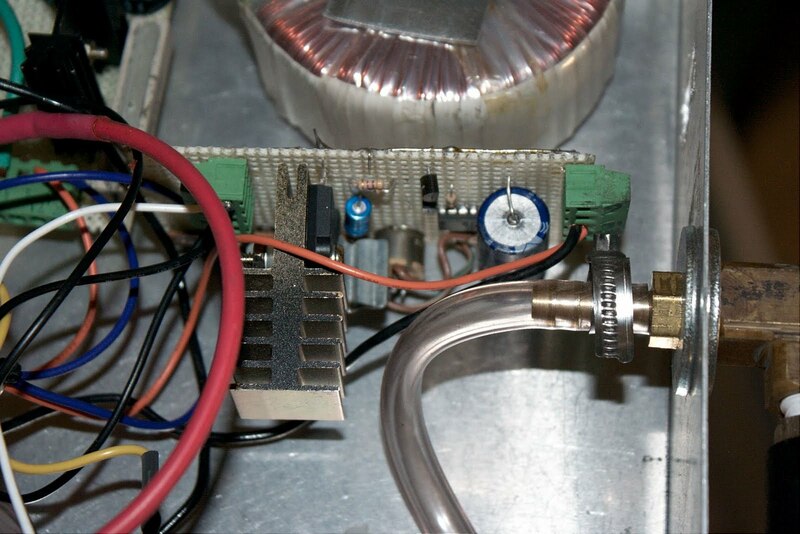 The second prototype moves the high voltage electronics into a separate unit; I also added previsions for a variable voltage supply, solenoid controlled air supply, and a separate powder chamber. Results were pretty good. Its still very much a prototype, for the next revision I'm moving things around and sending PCBs to be made. The system as I use it; lots of hours on it now. 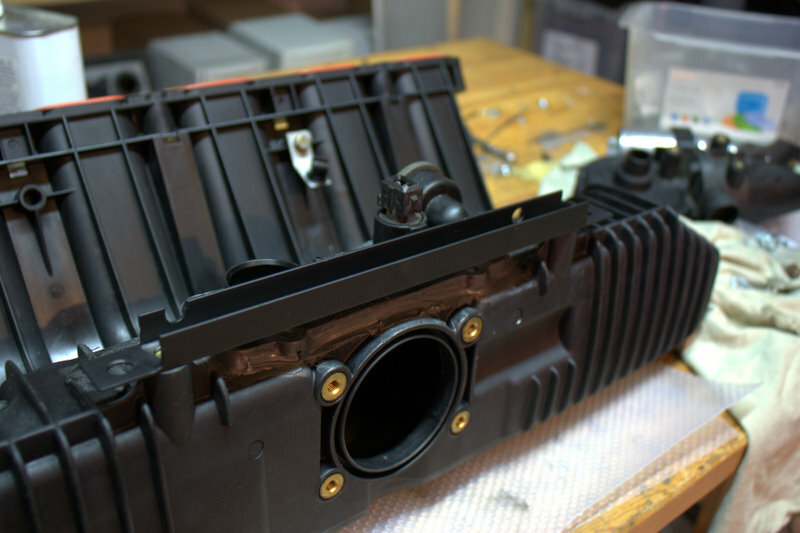 The AC-DC input stage is built around a standard toroid step down transformer; full bridge rectification and capacitor bank. The supply is controlled by a switch on the front. The adjustable stage is currently not implemented; instead I have simply added a 12VDC regulator used for supply of the switching section of the HV supply and for the actuator control. 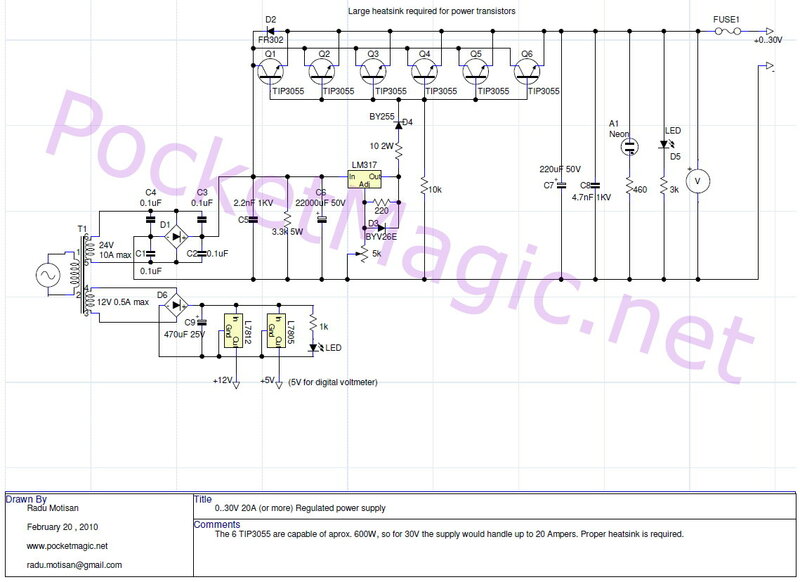 In the next revision I will be adding the variable voltage control using a standard adjustable regulator (LM317) with pass transistors to provide additional current. This stage is controlled via a relay which is controlled by a switch on the gun. 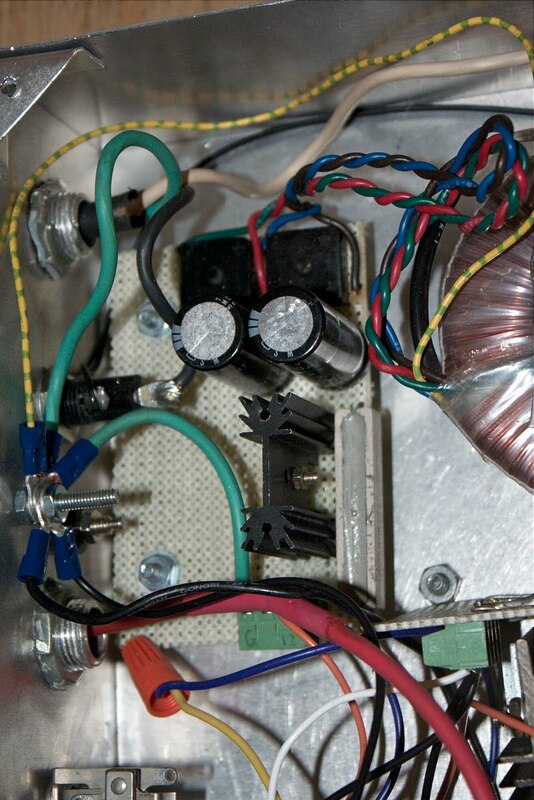 The high voltage step up stage is basically a switching power supply driving a flyback transformer out of a CRT computer monitor. 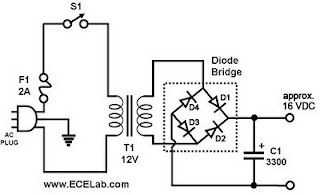 The frequency and pulse-width of the drive circuitry is tuned to match the transformer. 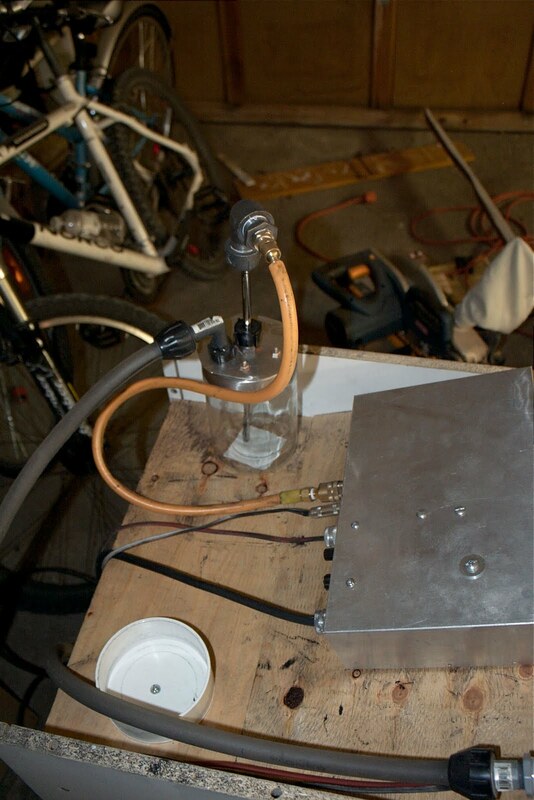 I set the duty cycle to 20% and adjusted the frequency until maximum output was observed (by measuring arc length). A 555 timer was used for pulse generation; it feeds a IRF240 power mosfet which drives the primary winding of the transformer. The primary winding was made by wrapping 8 turns of 14 gauge transformer wire around the ferrite core of the transformer. The flyback transformer is directly connected to the tip on the gun via 50KV high voltage wire bought off ebay. 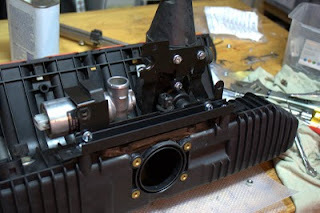 The air supply is set via an adjustable regulator on the front of the chassis; after the regulator the air is connected to a solenoid which is activated by a switch on the gun. 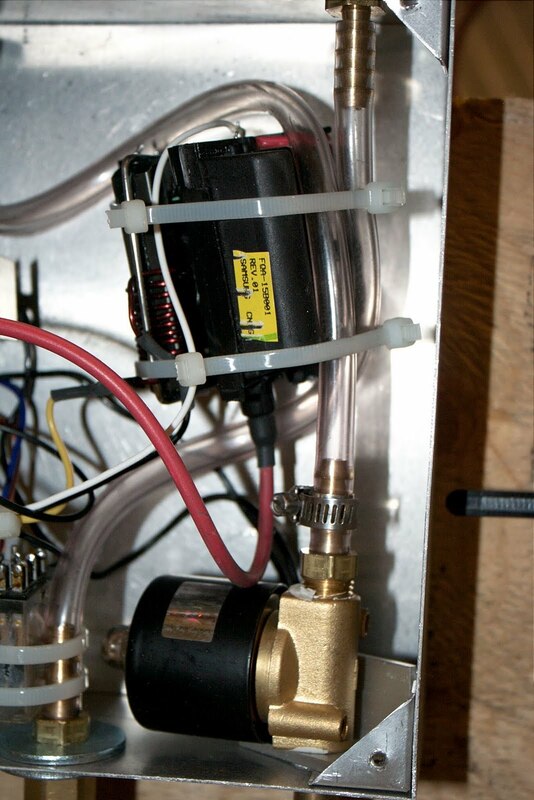 The regulator air supply is fed to a powder container; it feeds at the bottom of the container in order to fluidize the powder; the powder then travels to the gun. The gun its self is very simple it is simply PVC fittings which allow for attachment of various nozzles. 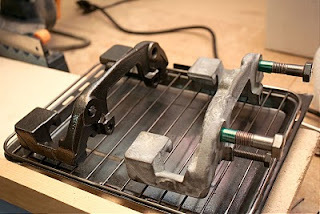 The nozzles were purchased from powder by the pound (they're cheap ~$12 so It was easier to buy rather than build). I've added a switch to the gun (not pictured) which switches on the HV and air. When it all comes together I have had some pretty good results; powder attraction is much better than with the Mark-I gun and powder flow is more consistent. Multiple layers work well (tested up to three layers so far). Powder coatingis great; but the hard part is getting a big enough oven to cook the parts in. 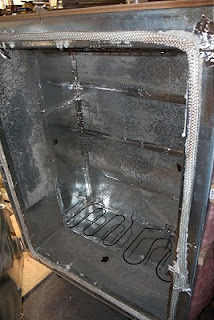 I ended up building my own oven from sheet metal and steel studs. Since I wanted to keep costs low I used left over bits from various projects and friends and family. It turned out pretty good; it doesn't look like much but it heats up quickly and holds its heat well. 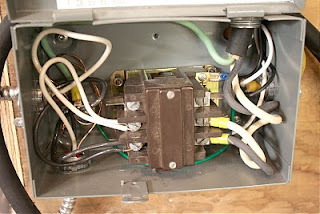 For temperature control; the elements are fed by 240V at 30A; they are connected via a electrical contactor which is controlled by a auto-tuning PID temperature controller. 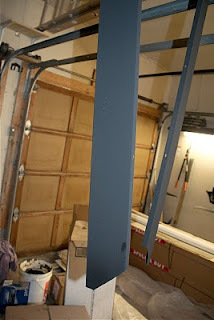 I've started building the MK-III version of my powder coating system. Here is the plan. - Provisions in chassis for second regulator and PSI gauge for future addition of powder pump. 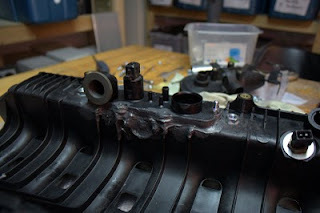 A few pics from the swap I did on my 1996 BMW 328is. 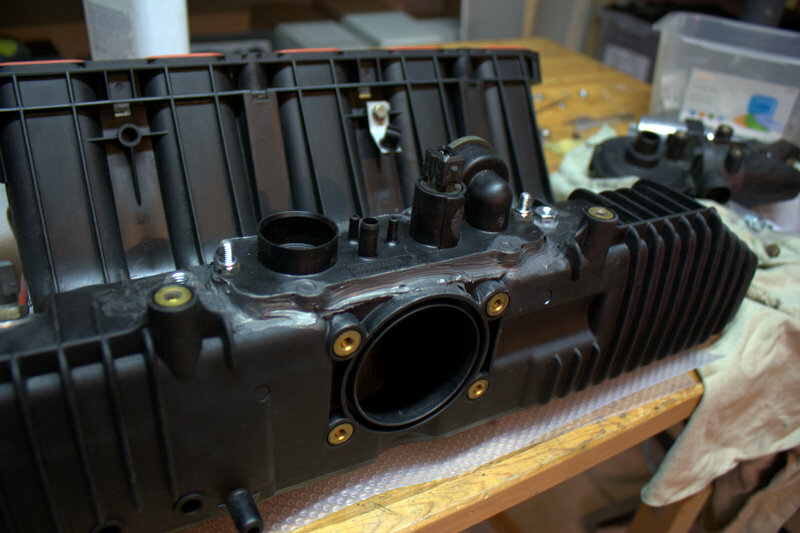 I modified the M50 manifold such that all of the existing M52 piping works without modification. This was accomplished by cutting the base of the M50 manifold such that it will accept the M52 ICV and oil separator mounting plate. I made an aluminum bracket (powder coated flat black) to allow the M50 manifold to mount to the M52 motor. So I've been roasting coffee on and off for a few years. 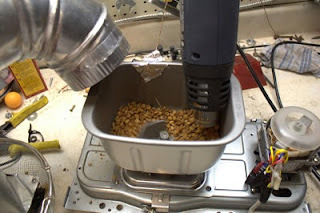 Below is a picture of my original method using an air-powered popcorn popper. 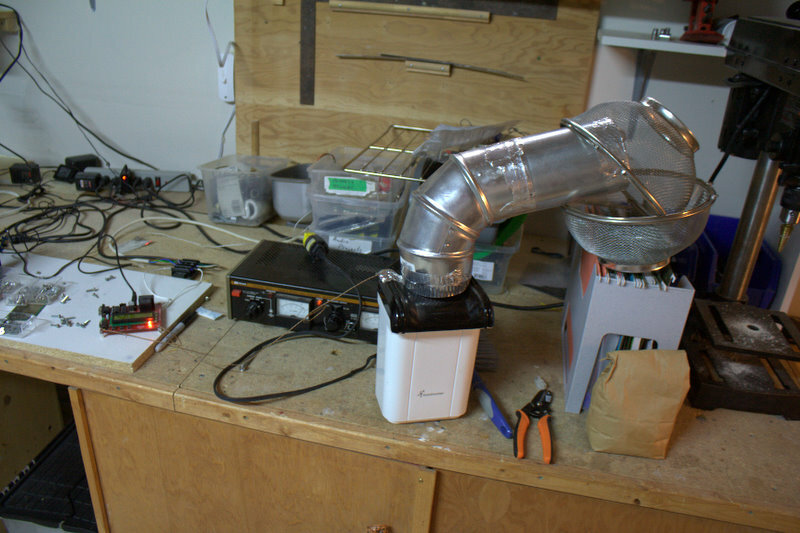 I modified it such that the fan can be controlled independently of the heater. To make things simpler I experimented with different methods of temperature control. 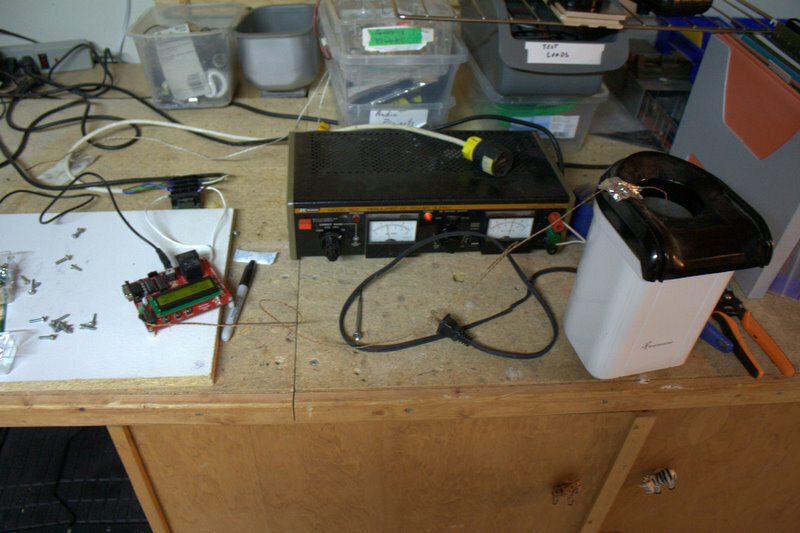 The picture below shows the Sparkfun electronics reflow oven controller connected to the popcorn machine. I programmed the reflow oven controller with a profile for roasting beans. 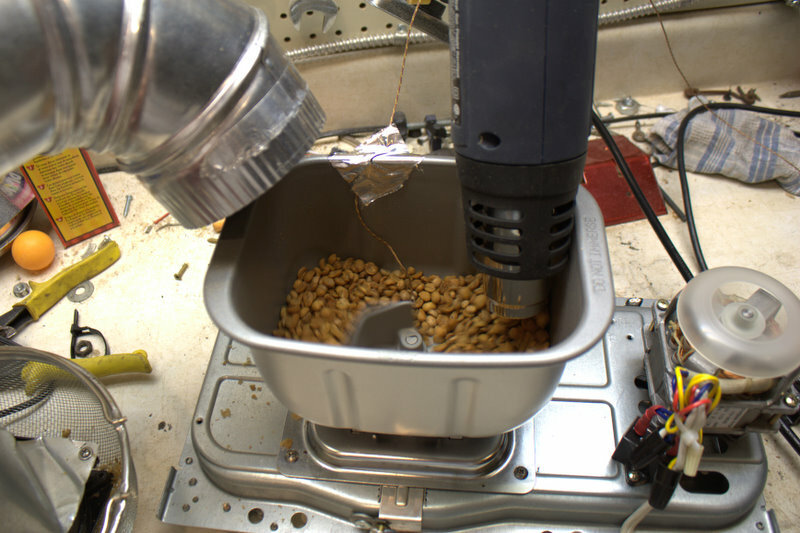 It works well and allows for consistent hassle free roasting. The big drawback of the hot air popper for a coffee roaster is the limit on the amount of beans you can roast at once. 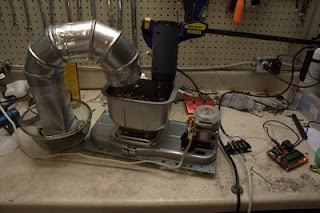 I rigged up a larger capacity roaster as seen in the pics below. 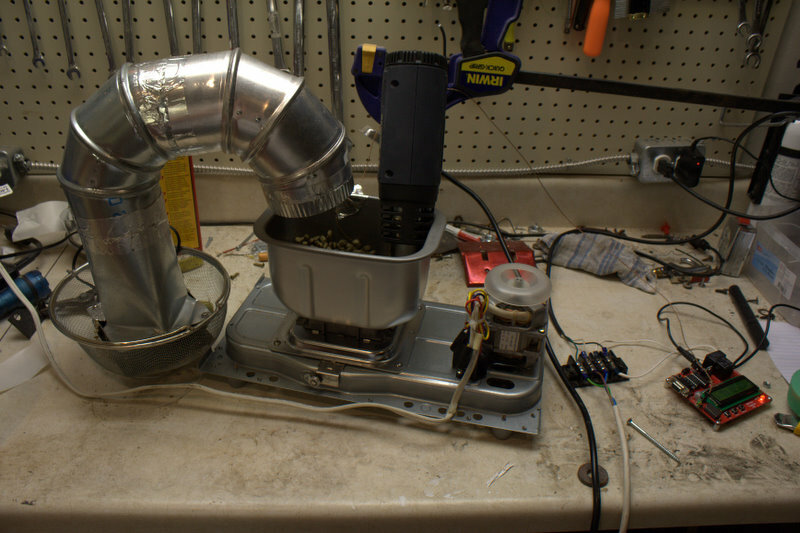 It is essentially the pan and drive of a bread machine, an exhaust vent to take care of the chaff, a heat gun to provide the heat, a thermocouple and temperature controller to run the show. 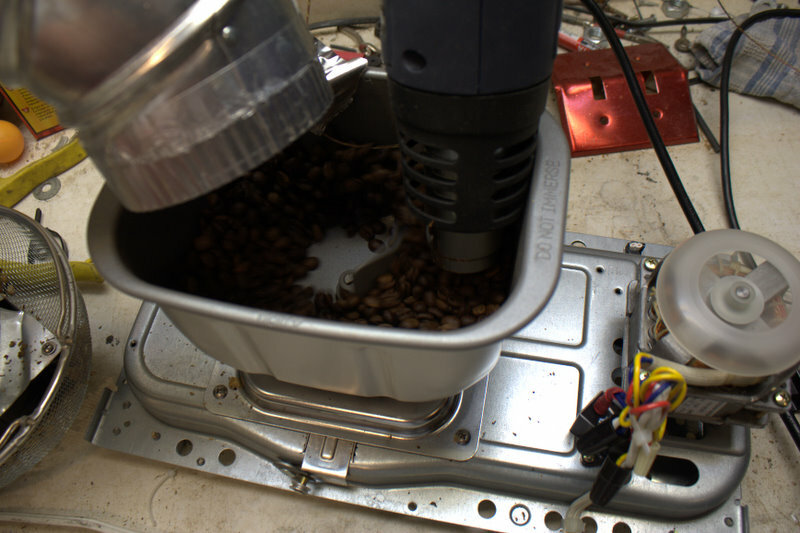 Results were good; consistent roast; no user intervention required.